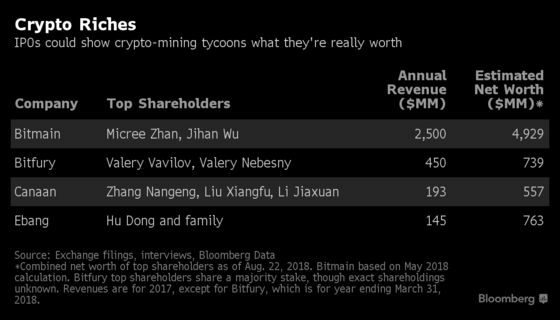 (Bloomberg) -- Some of the world’s biggest cryptocurrency tycoons are about to find out how much they’re really worth. The secretive bosses of Bitmain Technologies Ltd., Canaan Inc. and Ebang International Holdings Inc. -- three of the largest makers of cryptocurrency mining gear -- are all facing the prospect of public-market scrutiny for the first time as they pursue stock listings in Hong Kong. Bitfury, another industry heavyweight, is open to the idea of an initial public offering, though it doesn’t yet have any concrete plans. 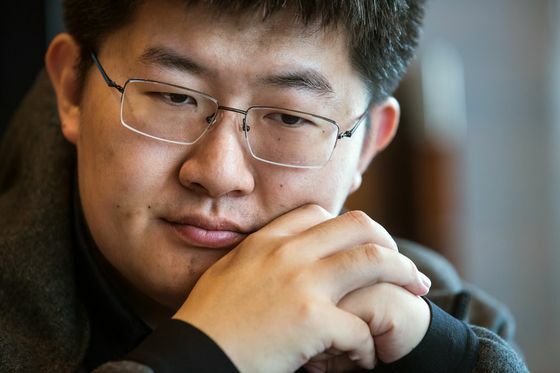 If they proceed, the share sales will represent a major test of whether the fortunes amassed by the likes of Bitmain’s Jihan Wu, Canaan’s Zhang Nangeng and Ebang’s Hu Dong are sustainable, or destined to fizzle. While all three companies enjoyed breakneck growth as Bitcoin soared 15-fold last year, the cryptocurrency and most of its peers have lost more than half their value in 2018 amid mounting regulatory scrutiny and concerns over exchange security flaws and market manipulation. The risk is that a lengthy bear market will erode demand for the companies’ specialized computer chips, which miners use to verify virtual currency transactions in a race for crypto-denominated rewards. 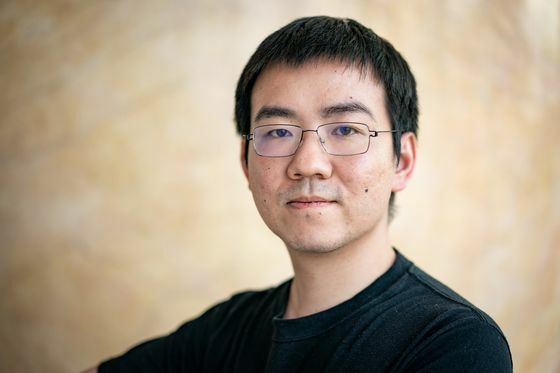 Bitmain, Canaan and Ebang are trying to adapt their technology for use in other fields such as artificial intelligence, but they’ve yet to prove that the new applications are scalable. Publicly traded shares would offer a real-time gauge of how investors view their prospects. “These IPOs will be a litmus test,” said Rohit Kulkarni, a managing director for private investment research at SharesPost. Given the limited public information on the financial results of crypto-mining gear makers and the other assets owned by their founders, pre-IPO estimates of their net worth involve a significant amount of guesswork. The projections in the following table incorporate information from exchange filings, interviews and data compiled by Bloomberg. Valuation multiples were derived from publicly traded chipmakers such as Nvidia Corp. and MediaTek Inc.
Bitmain, the industry’s dominant player, is planning an IPO that could raise as much as $3 billion, people with knowledge of the matter said this month. Wu, the company’s controversial 32-year-old leader, said in an interview that he and co-founder Micree Zhan together owned about 60 percent of the business, and that it booked $2.5 billion of revenue last year. In addition to selling mining gear, Bitmain also operates some of the world’s biggest mining collectives, in which members combine their processing capacity and split the rewards. It’s unclear whether that part of Bitmain’s business would be included in a share sale. Bitfury recorded $450 million of revenue in the 12 months through March, according to a spokesman. 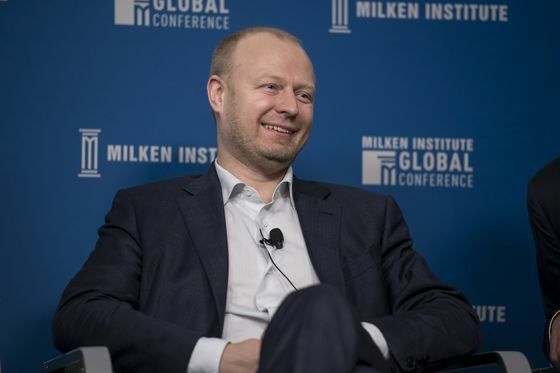 Chief Executive Officer Valery Vavilov and co-founder Valery Nebesny share a majority stake in the company, Vavilov said in an email interview. Three founders of Canaan -- Zhang, Liu Xiangfu and Li Jiaxuan -- each control stakes of around 17 percent in their company, while Hu and his family own 68 percent of Ebang, according to exchange fillings. Canaan and Ebang have already filed preliminary applications to list shares in Hong Kong, though the timing of the IPOs is unclear and the companies aren’t obligated to pursue them. Bitmain and Bitfury declined to comment, while Canaan and Ebang didn’t respond to requests for comment. Declining cryptocurrency prices may be one reason why the mining companies are selling shares now, so that existing owners can “capture some of the gains they’ve made from growing the business to this point,” said Gil Luria, director of institutional equity research at D.A. Davidson & Co. in Portland, Oregon. Bitcoin was little changed at about $6,700 as of 5:08 a.m. in Hong Kong on Monday. It’s down 53 percent this year. The offerings may appeal to money managers who are bullish on crypto but want to avoid the risks that come with holding virtual currencies, including unwieldy custodial arrangements, Luria added. The stocks would also offer investors exposure to the growth of artificial intelligence, said Kevin Wang, a Hong Kong-based analyst who covers semiconductor companies for Mizuho Securities. The application-specific integrated circuits, or ASICs, designed by Bitmain and its peers for crypto miners are useful for the heavy workloads associated with some forms of AI, such as machine learning. The companies’ AI ambitions may partly explain their decisions to pursue IPOs rather than initial coin offerings, which have been banned in China and some other countries. The Chinese government is a major backer of AI technology. Still, the decision to shun ICOs may irk some cryptocurrency purists, especially considering that some of the mining-gear companies have benefited from the proliferation of tokens generated by the ICO boom. For potential stock investors, cutthroat competition in the crypto mining industry may be just as large a risk as falling virtual currency prices. 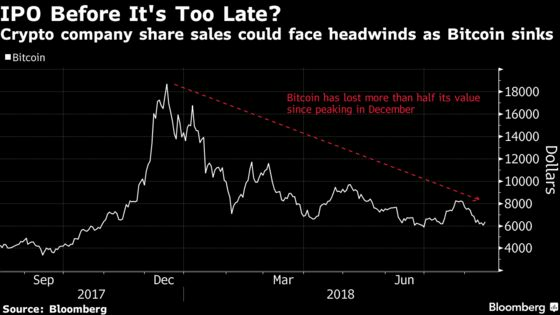 Concern that Bitmain is losing its technological edge prompted Sanford C. Bernstein & Co. analysts to warn in an Aug. 22 report that the company may need to take a major writedown on its inventory. “It’s a very competitive space,” Luria said.